(CNN) -- Sebastien Loeb's unblemished start to the World Rally Championship came to a shuddering halt on Sunday as Jari-Matti Latvala eased to victory at the Rally d'Italia in Sardinia. 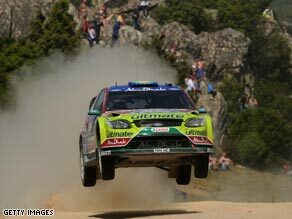 Latvala held off Ford team-mate Mikko Hirvonen to end Sebastien Loeb's winning World Rally streak. Latvala came home 29.4 seconds clear of team-mate Mikko Hirvonen as BP Ford claimed a morale-boosting one-two to finally break Citroen's stranglehold on the 2009 season. Loeb came into the race seeking to extend his perfect five-race winning streak at the start of the season, but a puncture on stage 11 proved fatal to his hopes, losing him a minute which he was unable to claw back. The win for Latvala was his second in WRC and signals a turnaround in fortunes for the Finn, whose place in the factory Ford team appeared in jeopardy prior to this event following a string of below-par displays and a massive accident at the fourth round of the season in Portugal. "It is a big relief," the 24-year-old told Press Association Sport. "It was a great thing that I was able to win this rally, it really means a lot to me. It's been unbelievable, but I have also been a little bit lucky with things being on my side. This has come at a really important point." Latvala's win came at the end of a topsy-turvy three days which often saw tactical driving employed at the expense of flat-out pace, particularly over the opening leg. Hirvonen and Loeb both slowed dramatically on the first day's final stage in order to avoid being the first cars on the road on Saturday, when they anticipated loose gravel on the surface would slow the leader relative to the chasing pack. The benefit of running later was not as dramatic as first thought, however, and although Hirvonen took 30 seconds out of Latvala on Saturday, bringing the gap down to just 10 seconds, he was unable to make further inroads on Sunday. Indeed Latvala was the quickest driver on the two opening stages, building a lead of over 30 seconds on Hirvonen which all but settled the final order. A still day in Sardinia meant there was no wind to disperse the dust kicked up by Latvala, leaving Hirvonen with restricted visibility which hindered his charge. Loeb's disappointing weekend looked to have finished with a podium place as he finally wrestled his C4 past the privateer Citroen of Petter Solberg on stage 15. However, the multiple world champion was subsequently hit with a two-minute penalty for an infringement committed on Saturday, dropping the Frenchman to fourth behind Solberg. Solberg settled for fourth ahead of Citroen Junior's Evgeny Novikov, while Britain's Matthew Wilson (Stobart Ford) finished sixth after recovering well from hydraulic problems on Friday.